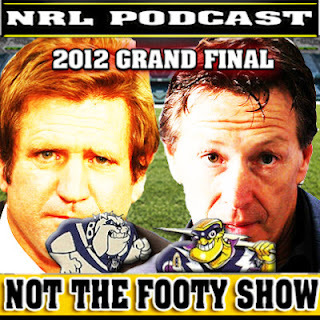 Luke Patten joins us to preview the Canterbury v Melbourne NRL Grand Final in our final show for 2012. NOT The Footy Show Episode 128 - Where too much League is just about enough in our super sized final episode... which could be our final ever. Join host Warrick Nicolson as he previews the Decider with former NRL star Luke Patten, Maria Tsialis, Matthew Duncan, Jake Hauritz, Nic McInerney, DC Chapman and Eyes is back with his GF tip. So you get a comprehensive preview of the Dogs-Storm and all our predictions in all our categories for the decider. So How do the Bulldogs Win? And How do the Storm win? NOT The Footy Show answers those questions and more with all our Guests. Luke Patten takes us through a few key areas from his time at the Steelers, Dragons and Bulldogs - in particular how a team reacts to Salary Cap penalties and do they use that as ammunition for a run at a title a couple of years later? Also who can win the #NRLTweetPlayerofSeptember Award with just the Grand Final to go? We recap the Queensland Cup Grand Final between Redcliffe and Wynnum, talk about Joey Johns and his impending Immortal status, celebrate the return of Roy and HG's Festival of the Boot on the ABC and look at why Tim Sheens got shafted and expect him to head to the Warriors in 2013. NOT The Footy Show has been somewhat part of your life for 3 years and if this is the end, THANK YOU for listening. NOT The Footy Show is done for 2012... we may have a sneaky NTFS at the GF Video for you but that's a maybe, not a promise.